Wellness area “Fountain of Youth”. We invite you to take a deep breath and refuel. Pamper your soul with our wide range of day packages. Let yourself be touched and relax with massages, soothing exfoliating treatments, facial packs or caring baths. Our trained staff will ensure that you feel relaxed whilst being pampered with exclusive natural and mineral products. 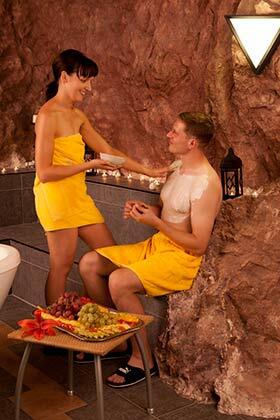 Enjoy the romantic atmosphere of the rock grotto! Bathe together or experience this unique atmosphere on your own, surrounded by candlelight. Float in weightlessness whilst your body is being enveloped by comfortable warmth and soothing sounds put you in harmonic oscillations. As the highlight of every wellness stay we offer pampering and relaxing wellness massages from head to toe. Medical specialist massages focus on a particular health aspect. We use exclusive minerals products of the Spa Find range. Also discover our package deals and spend a wellness or health holiday at the spa town of Warmbad!